©Manuel A. Soler Manuel 2016 . 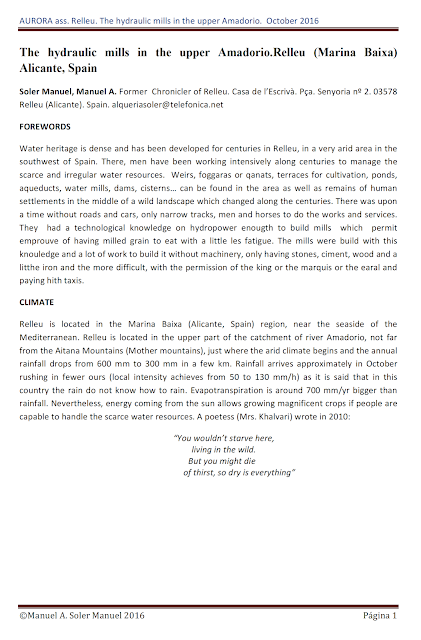 Water heritage is dense and has been developed for centuries in Relleu, in a very arid area in the southwest of Spain. 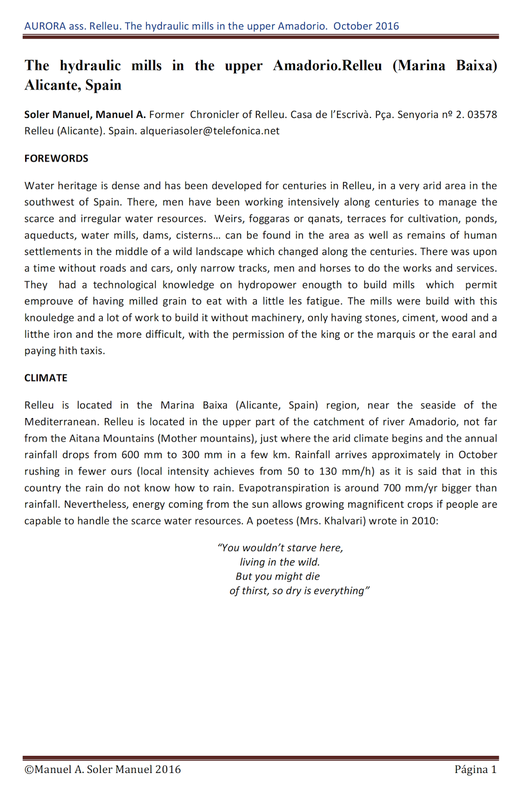 There, men have been working intensively along centuries to manage the scarce and irregular water resources. 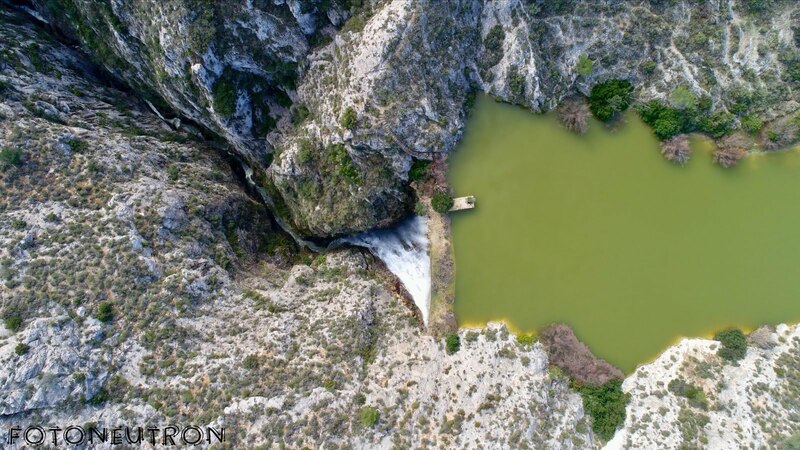 Weirs, foggaras or qanats, terraces for cultivation, ponds, aqueducts, water mills, dams, cisterns… can be found in the area as well as remains of human settlements in the middle of a wild landscape which changed along the centuries. There was upon a time without roads and cars, only narrow tracks, men and horses to do the works and services. They had a technological knowledge on hydropower enougth to build mills which permit emprouve of having milled grain to eat with a little les fatigue. The mills were build with this knouledge and a lot of work to build it without machinery, only having stones, ciment, wood and a litthe iron and the more difficult, with the permission of the king or the marquis or the earal and paying hith taxis. Figure 1. 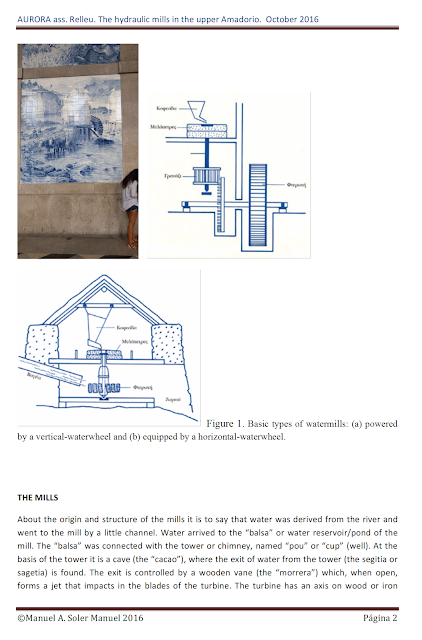 Basic types of watermills: (a) powered by a vertical-waterwheel and (b) equipped by a horizontal-waterwheel. (“arbre” (tree) if made on wood or “palaferro” if made on iron). The shape of the tower is like a ziggurat of three or four levels. The tower wall is made of stones. The thickness of the wall is larger in the base and smaller in the top. Thickness is the appropriate to support the strength generated by the hydrostatic water pressure. The tower is approximately 11 m high. Turbines (wheels) are open and in some way seem a Francis’ one but works as a Pelton turbine. At the beginning, turbines were made of pine green wood. The resin of pine waterproofs wood and then the turbine became nearly eternal. 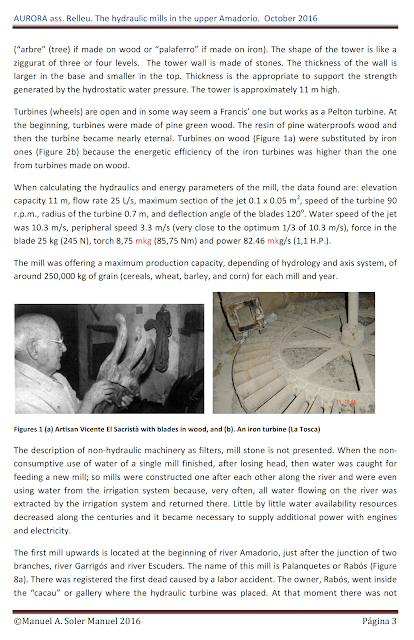 Turbines on wood (Figure 1a) were substituted by iron ones (Figure 2b) because the energetic efficiency of the iron turbines was higher than the one from turbines made on wood. When calculating the hydraulics and energy parameters of the mill, the data found are: elevation capacity 11 m, flow rate 25 L/s, maximum section of the jet 0.1 x 0.05 m2, speed of the turbine 90 r.p.m., radius of the turbine 0.7 m, and deflection angle of the blades 120o. Water speed of the jet was 10.3 m/s, peripheral speed 3.3 m/s (very close to the optimum 1/3 of 10.3 m/s), force in the blade 25 kg (245 N), torch 8,75 mkg (85,75 Nm) and power 82.46 mkg/s (1,1 H.P.). The mill was offering a maximum production capacity, depending of hydrology and axis system, of around 250,000 kg of grain (cereals, wheat, barley, and corn) for each mill and year. The description of non-hydraulic machinery as filters, mill stone is not presented. When the non-consumptive use of water of a single mill finished, after losing head, then water was caught for feeding a new mill; so mills were constructed one after each other along the river and were even using water from the irrigation system because, very often, all water flowing on the river was extracted by the irrigation system and returned there. 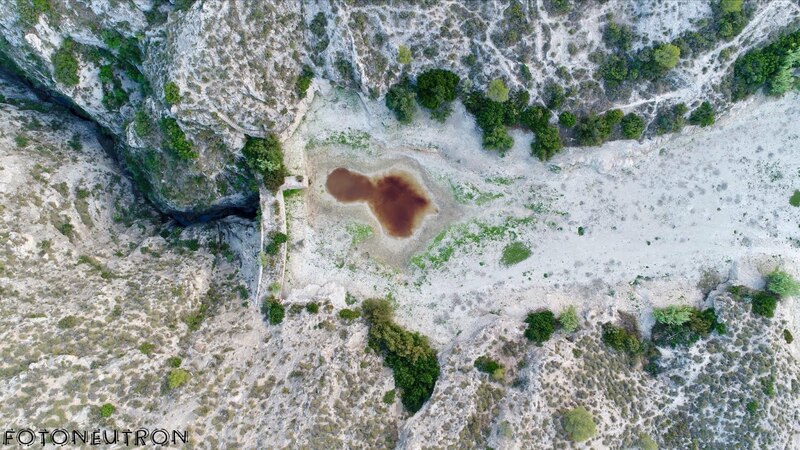 Little by little water availability resources decreased along the centuries and it became necessary to supply additional power with engines and electricity. water jet because the orifice was clogged by debris. He tried to unclog the orifice with a stick and water started to rush and pushed the turbine to run. The turbine wound Rabós seriously and he died after few hours. Going down the river the water intake for the Tosca’s mills and for the irrigation network is found. Water used to flow in a channel to a point where there the Tosca spring is located. 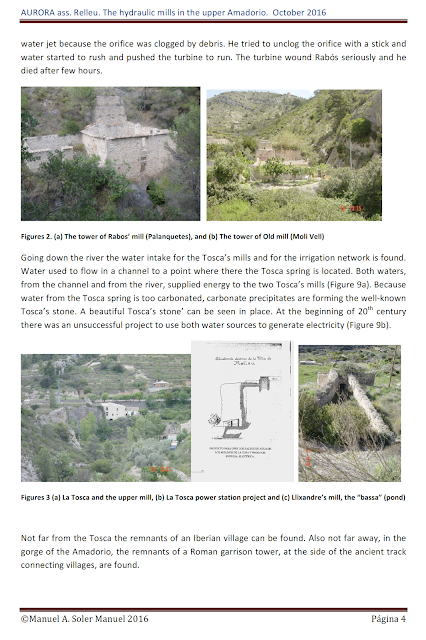 Both waters, from the channel and from the river, supplied energy to the two Tosca’s mills (Figure 9a). Because water from the Tosca spring is too carbonated, carbonate precipitates are forming the well-known Tosca’s stone. A beautiful Tosca’s stone’ can be seen in place. At the beginning of 20th century there was an unsuccessful project to use both water sources to generate electricity (Figure 9b). Not far from the Tosca the remnants of an Iberian village can be found. Also not far away, in the gorge of the Amadorio, the remnants of a Roman garrison tower, at the side of the ancient track connecting villages, are found. Water goes further on; flowing by the system, river and channel, and arrives to the Old Mill (Molí Vell, Figure 2b) more than 400 years old. There are documents indicating that that the first Molí Vell paid taxes to the landlord in the Middle Ages. There is another history about the Molí Vell. A daughter killed his father making the hydraulic turbine start while dad was repairing the machinery. This was the revenge for an incestuous behavior. Following the water track the Llixandre’s mill (Llixandre, Iskandar, Xicandar, Alexander; Figure 3c) appears. After it, arriving to Relleu, the upper mill (Figure 10b) and the downwards mill are found. 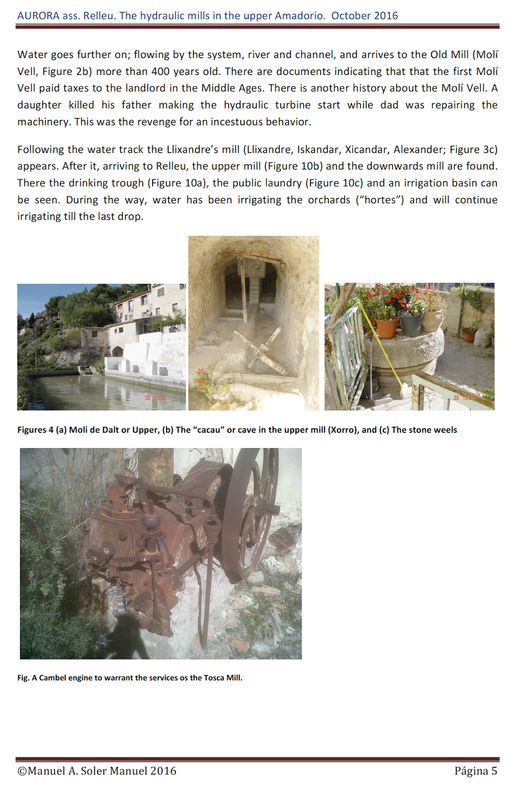 There the drinking trough (Figure 10a), the public laundry (Figure 10c) and an irrigation basin can be seen. During the way, water has been irrigating the orchards (“hortes”) and will continue irrigating till the last drop. Fig. A Cambel engine to warrant the services os the Tosca Mill.